Police say the man said 'I'm going to push you' before he shoved the woman onto the tracks in the East Village. Rana Novini reports. A woman was pushed onto the tracks at a subway station in the East Village Tuesday night, police say. The 49-year-old victim, Kamala Shrestha, was standing on the northbound platform at the F train station around 9 p.m. when a man in his 20s approached her from behind and shoved her unprovoked, police said. The stranger told her, "'I'm going to push you,' maybe 'I'm going to kill you,'" Shrestha recounted from her home Wednesday morning, still in shock and recovering from an injury to the head. "He just had a very angry face." Several bystanders rushed to her aid and pulled her off the tracks, seating her on a nearby bench. No train was approaching at the time, authorities say. "Two guys, they were young guys, they said, 'Come on, come on, come on!' And they gave me a hand," said Shrestha. 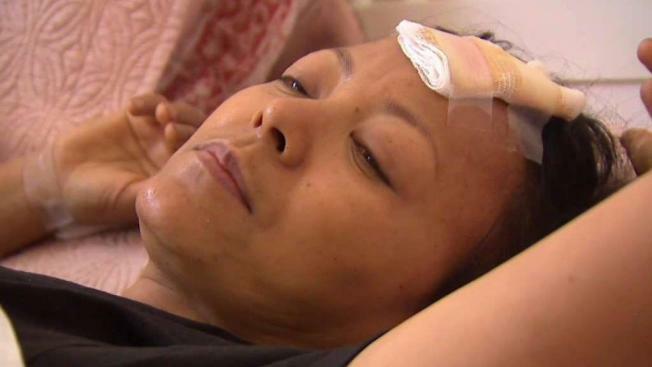 Shrestha was taken to Bellevue Hospital with a cut to her head. She was home recovering with a bandage to the head Wednesday. The suspect was last seen wearing a black shirt and dark pants. Police are still searching for him as they interview witnesses and scour surveillance video. Shrestha's husband wants police to catch him quickly. "This thing that happened to my wife yesterday, that can happen to anybody else," said Namlal Shrestha. Commuters know the chance of being pushed onto the tracks is a real possibility for anyone. The Shresthas now want to find the good Samaritans who helped Kamala. "They saved my wife's life," said Namlal Shrestha.